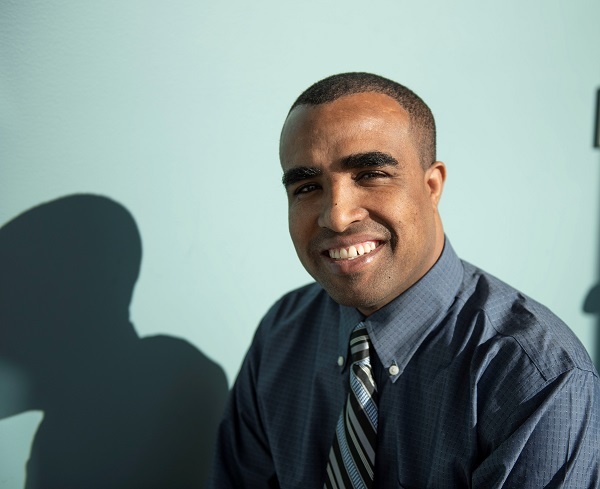 When Girma Admasu graduates from the Washington State University College of Nursing with his Doctor of Nursing Practice (DNP) degree, he’ll have the skills and knowledge to become a family nurse practitioner, one of the most sought-after health care professions in the nation. He’ll also be fulfilling a goal he set for himself when he was 8, living in rural Ethiopia. His mother got an infection that was left untreated, and she lost her hearing. “My mom would have been fine if she’d gotten treatment in time,” said Admasu, now 32. Though none of his seven siblings would graduate from high school, he set his sights on becoming a nurse or a doctor. He moved to the United States in 2008 and took his nursing prerequisites in community college in the Seattle area, working two jobs at the same time so he could send money home for his family. He started in WSU’s Bachelor of Science in Nursing program in 2012. He had gone home to marry his high-school sweetheart in 2010, and their son was born in Ethiopia while Admasu was finishing his prerequisites. He’d been accepted to WSU and needed to complete that course work. He became a U.S. citizen and brought his wife and baby boy to Spokane, meeting his son for the first time when he was 11 months old. He and his wife now have four kids under the age of 7 and own a house in Spokane “so we can live the American dream,” he said, smiling. A nurse in the nephrology unit at Providence Sacred Heart Medical Center, Admasu expects to receive his DNP degree this year. He wants to work with under-served communities in Spokane as a nurse practitioner. He still sends money home to his siblings and hopes that he’s been a role model to them and their children. He said he’s never had a minute of doubt that nursing was the right choice for him.